The holiday season is upon us, and with it comes a great offer from P&O Ferries for all of you who are planning a little day trip to France to stock up on local delicacies for those cold days. Everybody knows that a bit of nice cheese and a glass of wine will help ward off that dreaded Sunday afternoon blues, and where better to shop for these precious goods than with our French neighbours who are experts in these fields? From £19, you could cross the channel for a spot of shopping and bag of six free bottles of wine of your choice (red, white or rosé)! In addition to that, you will also receive a buy-1-get-1-free voucher for either an English Breakfast or a portion of Fish & Chips onboard the P&O Ferries food court. This special offer ends on Thursday 1st December, with travelling at the discounted rate valid until 15th December. For more information about this great offer, click here. The early heralds of Christmas are upon us. We’re going to have to ignore Halloween and Firework’s night draws up too many Balotelli allusions so we’re looking ahead to Lille’s Christmas Markets. They start on the 19th of November and are open every day except 25th December right up until New Year’s Eve. 83 Wooden chalets are set up for independent market stalls and all the shops of Lille compete to have unique and exciting window displays. 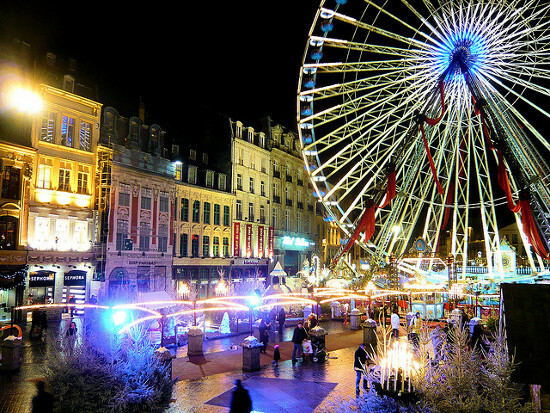 You’ll be able to find all manner of Christmas presents in Lille, whether you’re after something special or on the hunt for a bargain. The Christmas market is set up in the Place Rihour,if you have trouble finding it, it’s the one with the 18 meter high Ferris wheel and ‘Marche De Noel’ written everywhere. The market is small in comparison to some of the German Christmas markets you may have been to, but the city of Lille has lots to offer. The city has a rich history with signs of original settlement dating well before the Middle Ages. The cities involvement in major French and European events are well recorded here, so it’s certainly worth droping by a museum or exhibition before travelling home. There are a number of hotels available if you intend to stay the night or wish to make a long weekend of it. P&O Ferries offer a £35 each way fair, which allows you to stay as long as you need – the price includes transport for your car and up to 9 passengers. Alternatively you could make a daytrip of your shopping, the £25 daytrip fair is definitely one of the best deals for getting yourself, your car and your kids on to the continent. P&O’s channel crossing from Dover to Calais is an hour and half journey, so you might want o book an early one for your trip to Lille’s Christmas markets. If you feel a restive city break on the continent coming up, a journey to Europe’s 3rd richest city Brussels, could be on the cards. As you may have seen from the iAmsterdam post last week a tourist card is a very economical way to get a feel for a new city and Brussels offer a similar deal. A Brussels Card can be purchased to last, for up to 72 hours, and will entitle you to free entry to 30 of Brussels’ museums and offer discounts to many more. You’ll also get free transport on underground, bus and tram. For this reason you may want to pre-order your card so it can be picked up upon arrival at either the airport, train station or a Brussels Tourist information office, the details are given to you upon purchase. Alternatively you can just buy your card upon arrival at any of the mentioned locations – but there is a discounted online price. Your Brussels card will also entitle you to discounted meals and drinks in participating locations as well as certain designer boutiques, exhibitions and attractions. A P&O Ferry can get you to Zeebrugge, and you can tour through Belgium on your way to Brussels, pick up your card and absorb as much culture as you can take. With the Dutch Christian Democrat Party pushing for a tougher line on cannabis, many prospective visitors to Amsterdam worry that they might miss out on the coffee shop experience (in Maastricht, all foreigners except German and Belgian passport holders are banned from coffee shops). But even if the ban on tourists does make it into law, there are plenty of other hangouts in Amsterdam that you can relax and have a drink or two in. 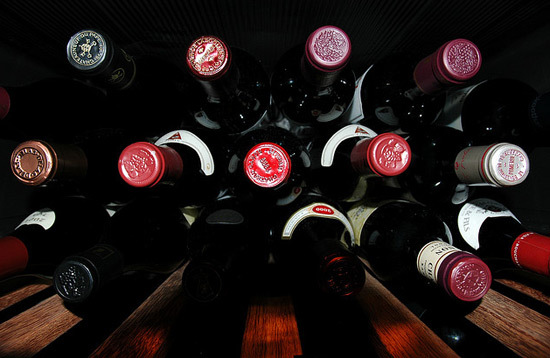 Here are five suggestions to get you started. One for the beer drinkers. There are separate rooms for smokers and non-smokers, and again there’s a refreshing (literally) lack of run-of-the-mill beers and annoying music. 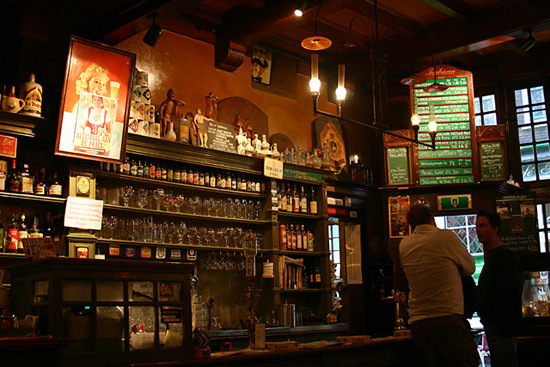 In de Wildeman is a great spot for stretching your legs over a quiet pint of either Dutch or Belgian beer (there are Beer of the Month and other recommendations if you’re unsure what to go for), maybe accompanied by some tasty bar snacks and topped off by the authentic, cosy pub feel and décor. After you finish snickering, you might be interested to hear that this tiny drinking hole implements a ban on mobile phones and features some of the most professional and amiable barmen in Europe. A place that does away with modern day horrors like TV screens, loud funky house music and coloured cocktails, the Wynand Focking provides what a bar should – a place to drink and chat. The drink selection is focused on sweet brandy liqueurs, and with over 60 to choose from, there will definitely be one that suits your personal taste. Named after one of grunge’s great bands, this is a great indie/rock bar with a lovely terrace overlooking a nearby canal. DJs spin alternative pop hits (there’s also the occasional live gig), people chat away about music and, after a few drinks, even shake their limbs awkwardly. The beer is good, and there is a pool table. In short, it’s a little bit of heaven. Punters can choose from more than 1,000 different whisky and bourbon options at this impossibly snug and welcoming bar. You might want to browse the menu (which divides drinks according to country of origin) or you could rely on the barmen’s recommendations – both are fun and rewarding options. Again, this is a place to drink and talk until late (the Whiskycafé is open until 3am during the week and 4am on weekends) rather than drink to oblivion/the point of public embarrassment, so don’t expect blaring speakers and cheesy chat-up lines. You can get to Rotterdam with P&O’s great current offer of a 3-day minicruise from Hull to Amsterdam, which involves all the comforts of P&O Ferries’ onboard catering and entertainment as well as a night in the great city itself. Go here for details. This will be the 20th anniversary of Boulogne-sur-Mer’s annual Herring Festival brought to you by Fishing Animation, the Chamber of Commerce and Industry of Boulogne-sur-Mer Cote d’Opale. 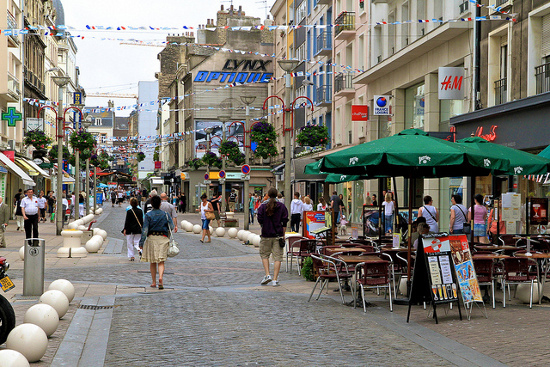 If you fancy a brisk coastal holiday P&O Ferries Dover to Calais service will leave you just a short journey to Boulogne, easily navigable by public transport, or you can of course take your car along with you. This is an excellent chance to enjoy fresh herring or kipper, they’re cooked up on huge barbecues, the whole town turns out for this event, with a joyful atmosphere and glass of Beaujolais you can have a fun and tasty trip to northern France this winter. You’ll be able to sample all the locally caught fish and the many variations of servings; the festival is on over the weekend of the 19th November, so dress warm. Boulogne-sur-Mer really goes all out for the Herring Festival with traditional dress, there will be a musical performed by Dominique Pourre on the Saturday starting at 3. The festival starts at 10 AM so you may want to arrive the night before, the day doesn’t finish until 7pm so there will be plenty of time for you to travel on the Saturday it begins. P&O Ferries run a frequent Dover to Calais service, from there it is about a half an hours’ drive to Boulogne and all the herring you can eat. We can understand the widespread urge of many people to escape the European autumn with a trip to warmer climates, but there is much to be said for a trip that doesn’t include long hours at an airport. A drive across the channel, for instance, will not mean that you can ditch the winter coat, but it will broaden horizons and relax in equal measure. One city to take in on your next trip to mainland Europe could be Liège in the Western, French-speaking Ardennes region in Belgium. Close to the Netherlands and Germany, it’s a great stopover on any European road trip and well worth a couple of days’ exploration. A university city, it offers that cosy student town feel as well as typically European architectural history in the shapes of castles, churches and government buildings. One is the Chateau de Jehay, built in the Renaissance period and stuffed with lovely details from that era – the furniture has been preserved beautifully, and the gardens with their waterfalls and statues make for some great walks. 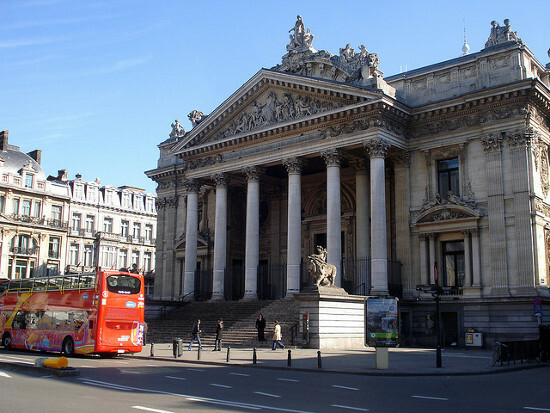 The Museum of Walloon Art is a great tip for art aficionados. It is dedicated to artists from the francophone region of Belgium and shows off work from the 16th century onwards, all the way up to today. Children younger than 12 get in free, and entry is for all on the first Sunday of every month. The Museum of Modern & Contemporary Art is another great hangout, specialising as it name indicates on paintings and sculptures from the last 150 years. If you’re into your modern architectures, have a look at the main railway station in Liège, which sports an impressively complex and slick structure of white beams arching over the top of the train tracks. 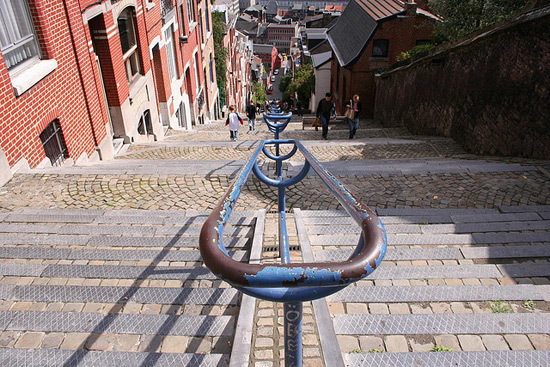 To get to Liège and experience its cosy, unique atmosphere and sights, you can take a P&O Ferry from Hull to Zeebrugge, from where you can start your little European road trip – with Liège as your first pit stop! 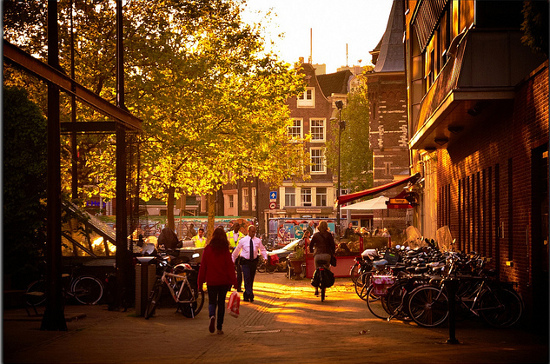 If you are planning a trip to the Netherlands we’d recommend you look into purchasing an iAmsterdam card. For those of you intending to do a bit of cultural tourism the iAmsterdam association will really help you make the most of your trip, letting you jump the queues to get in to museums free, discounts on food and free public transport. You can order your iAmsterdam ticket online and get a 5% discount or pick one up in the Netherlands’ capital once you arrive. You have a choice of cards 24 hour, 48 hour and 72 hours, considering that this little card puts the entire capital at your feet. You’ll have free or discounted access to exhibitions, live music, theatre dance and festivals. They also offer access to the canal hop-on-hop-off Bus, which is a sublime way to traverse the city, making the most of this service will add a leisurely pace to your holiday, honestly who doesn’t love a boat trip? You can also order family passes so if you want to take the children with you it’s a brilliant means for an inexpensive trip filled with the wonderful sights and curios that only Amsterdam has to offer. If you take a P&O Ferry to Rotterdam, you can use your iAmsterdam card to get to the capital and then all you have to do is flash it at the entrance of all participating venues for access. 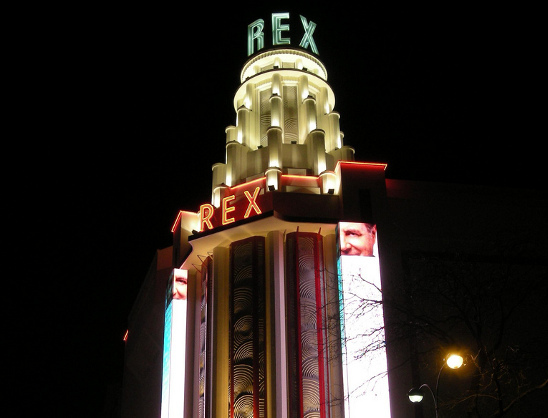 The famous Le Grande Rex cinema, in Paris, is opening a special exhibit on the 22nd of October with all the signatures it has gathered from visiting movie stars and singer on display. These include such huge names as Woody Allen, Cesaria Evora, Angelina Jolie and (if it’ll impress you) Justin Bieber. Etoiles du Rex is an interactive tour (think Universal Studios in Paris). It welcomes all ages and would make a fun day out for the family or anybody with an appreciation of the movie making process. Although the theatre itself is far more impressive to behold at night when the tower is lit up a tour during the day will certainly be well worth it. The tour is not without its share of surprises, you and your companions can do a bit of acting and be superimposed into movies such like King Kong and you’ll get the chance to purchase your footage on DVD. Your digital tour guide French cartoon star Manissa (styled on Jessica Rabbit), you get to have look through real sets and see animatronic puppets come to life. You’ll get a talk through some of the workings of movies including special effects and sound effects. For a unique and intriguing tour of European cinema take a P&O Ferry from Dover to Calais, bring the car, bring the kids.